Looking for a conflict-free alternative to a mined diamond? One that is eco friendly, sustainable, pure and rare? You now have a choice. Lab grown diamonds. They are identical to mined diamonds - pure carbon diamonds. 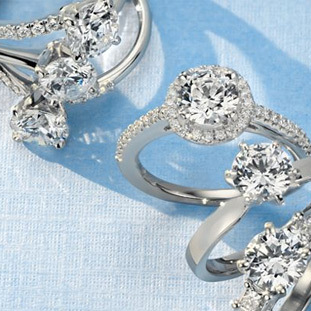 Pure Grown Diamonds have the same physical, optical and chemical properties as their natural counterparts. They're molecularity identical. But instead of mining them from earth, these are the result of highly advanced technologies. This advanced technology replicates the conditions necessary to grow a diamond crystal. A small diamond seed is placed in highly controlled lab environment. Here the rough diamond seed grows, atom by atom, and layer by layer - thus recreating the natural process that takes millions of years. The result is a rare, beautiful and sustainable gemstone. Like mined diamonds, grown diamonds still need to be cut and faceted. They use the same equipment and techniques. The end result is the same brilliance, fire, sparkle and scintillation. The only difference is their origin. The colorless and the fancy pink colored Pure Grown Diamonds are classified as type IIa, which is the purest form of diamond known to man. After exhaustive research, we found Pure Grown Diamonds to be best source. That is why our lab grown diamonds are from Pure Grown Diamonds. 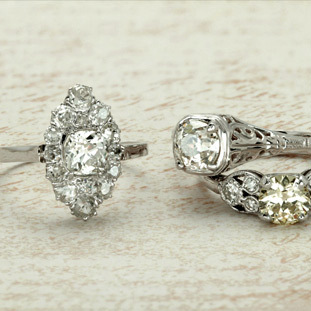 Each of these rare diamonds are cut to ideal proportions for maximum brilliance and beauty. (In contrast, most mined diamonds are not cut to ideal cut standards.) In addition, each Pure Grown Diamond comes with an independent diamond laboratory certificate from IGI or GCAL, assuring you of it's authenticity as a diamond as well as it's quality. Colors available are near colorless, fancy pink and fancy yellow. Clarity can range from Internally Flawless (IF) to Slightly Included (SI). All of the popular shapes are available in grown diamonds: round, princess cut, emerald cut, radiant cut, asscher cut and cushion cut.